I got picked on in LFR by the other tank for not being correctly enchanted/gemmed. 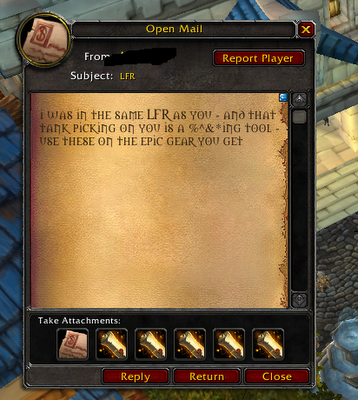 Stranger sent me this I replied to him with a Sapphire Cub :) I was lucky to get some epics fast and put those enchants to use. As a beginner I find it hard to want to keep playing. Even my friends who encouraged me to start make it tedious to play because all they want to do is power level me so I can be their group's healer. No learning the lore, no time to read skills or talents..
No one wants to help me and I'm criticized for not fully knowing what to do. God forbid I ask someone. I wish people would be more helpful and understanding. I feel for you. A lot of people regard endgame as the objective of all Warcraft, which is a bit silly considering how quickly one gets bored of the endgame content - there really isn't much there unless you love endless repetition. The questing content, on the other hand, is HUGE and very diverse, and you can really dive into it for days. My advice would be to try an RP server. I resisted for a long time (there's a lot of stigma attached to RP and the people who do it) but they really are just lovely servers where people take their time and are more interested and interesting. Also. Try out Star Wars: The old republic. That game has amazing leveling and questing, and it is free to play now.